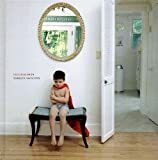 I saw Julie Blackmon's exhibition "Domestic Vacation" at the Claire Oliver Gallery in Manhattan, and her photographs were immediately impressive for their humor and their portrayal of the weirdness of modern family life. One of the most striking pictures is not directly included in her book of the same name: "American Gothic" has a man, a woman and two small children posing for the camera. The woman holds a baby who is looking away; the man holds a little boy upside down by his ankles. Next to them is a bird making the picture especially incongruous. They are dressed in black and white, and stand against a wall with painted portraits on it, so it looks as if they were posing for a family picture. The man looks very stern, the woman looks slightly harried, and we get the impression this is the most formal pose they can manage. The children and teens are the focus of these pictures; at the easiest level of interpretation, the pictures show them disrupting family life with their crazy antics, and we might see them simply as a reflection of modern family life. In "The Baby Sitter" a boy sits at a dining table looking at a laptop with a wide-eyed and uncomfortable look on his face, and another boy looks on holding his head, and the supervising teen girl (just out of shot) just listens to her iPod. In "The Hill," a man in shades crouches down on the grass smoking a cigarette striking a pose, a younger girl lies on the grass looking away, and a little girl chases after an old pram going down the hill in the background. In "High Chair," a baby in a huge orange diaper, holding some food, stands precariously and overconfidently in a large wooden high chair while someone, out of shot, sweeps the kitchen. Yet these are not true-life pictures of family life, and they are about much more than the silly and scary things that kids do. There's some cultural commentary here: looking carefully, one finds references to many of the brand-named items that fill our homes: Sony Play Station, Apple Computers, Hershey's Kisses, Revlon, Sephora, and several times, Target, whose TV advertisements have been so successful at giving us a vision of the happy consumer. Much in Blackmon's work here echoes the exuberance of those Target ads, but of course, there's a darker tone to them, even if it undercuts itself. In "Flying Umbrellas," two umbrellas in the Target red and white colors fly away with a woman in a bikini in the background reaching up for them, while in the foreground, a boy stands next to a swimming pool looking up at the sky with binoculars and a girl paddles in the pool. There's a toy shark by the side of the pool, but what looks to be a small yet real shark in the pool. In "Stolen Kiss," an older child is taking away a giant silver-wrapped piece of chocolate, while a younger child stands at the bottom of the stairs crying her eyes out. We at least get the impression that these products create some dangers and additional frustrations. In a great many of these images, people are not interacting with each other, but each lives in their own separate world, despite being in the same space. We see three girls in the same room in "Saturday," but they are not even looking at each other: one is reading a magazine, another is listening to an iPod, and the third sits on top of a sofa looking bored. The idea that modern life is an isolating one not improved by the consumer society is certainly a theme for this set of works. This sense of a flawed reality is emphasized by the feel of the images. Most of them have a lovely color palette and well-ordered composition. They have a sense of artificiality though, and this often comes from the use of a computer graphics program to create the images. In many cases, it is clear from the crisp edges of images of people or the backgrounds that they have been cut and pasted into the picture. Even when there are no signs of computer work, the formality of the composition is very distinctive. In "Bubble Tape," a young boy sits at the end of a long wooden table preparing to lower a pink tape into his mouth while someone else is coming in to continue laying the table. There is a dresser, a painting, and a set of candles on the wall behind them. Because of the bareness, it looks like no one's real home, but rather more as a symbol of a home, and is highly stylized. Nearly every picture in the book has a similar feel, adding an air of surrealism to the work. Despite the cracks in perfection, Blackmon is not attempting a major political critique of the construction of childhood and family life. The images are amusing rather than didactic, and very often they are completely dominated by the beauty or quirkiness of the children, and in other cases, the images are notable primarily for the arrangement of people or objects. The other themes filter into one's perception with some subtlety. There's an illuminating interview with Blackmon by Alison Nordstrom about the relation between her work and her life experience coming from large family and having three children of her own, and in their discussion, Blackmon cites Sally Mann as one of her primary influences. While Blackmon's work is far more obviously stylized than Mann's, it is possible to see the connection between the two photographers in their both providing a transfixing portrayal of everyday life. Domestic Vacation is a remarkable and attractive collection that deserves attention.